The advances described are the result of my research carried on for many years with the chief object of transmitting electrical energy to great distances. The first important practical realization of these efforts was the alternating current power system now in universal use. I then turned my attention to wireless transmission and was fortunate enough to achieve similar success in this fruitful field, my discoveries and inventions being employed throughout the world. In the course of this work, I mastered the technique of high potentials sufficiently for enabling me to construct and operate, in 1899, a wireless transmitter developing up to twenty million volts. Some time before I contemplated the possibility of transmitting such high tension currents over a narrow beam of radiant energy ionizing the air and rendering it, in measure, conductive. After preliminary laboratory experiments, I made tests on a large scale with the transmitter referred to and a beam of ultra-violet rays of great energy in an attempt to conduct the current to the high rarefied strata of the air and thus create an auroral such as might be utilized for illumination, especially of oceans at night. I found that there was some virtue in the principal but the results did not justify the hope of important practical applications although, some years later, several inventors claimed to have produced a "death ray" in this manner. While the published reports to this effect were entirely unfounded, I believe that with the new transmitter to be built, this and many other wonders will be achieved. Much time was devoted by me to the transmission of radiant energy, in various forms, by reflectors and I perfected means for increasing enormously the intensity of the effects, but was baffled in all my efforts to materially reduce dispersion and became fully convinced that this handicap could only be overcome by conveying the power through the medium of small particles projected, at prodigious velocity, from the transmitter. Electro-static repulsion was the only means to this end and apparatus of stupendous force would have to be developed, but granted that sufficient speed and energy could be realized with a single row of minute bodies then there would be no dispersion whatever even at great distance. Since the cross section of the carriers might be reduced to almost microscopic dimensions an immense concentration of energy, irrespective of distance, could be attained. A new form of high vacuum tube open to the atmosphere. Provisions for imparting to a minute particle an extremely high charge. A new terminal of relatively small dimensions and enormous potential. An electro-static generator on a new principle and of very great power. 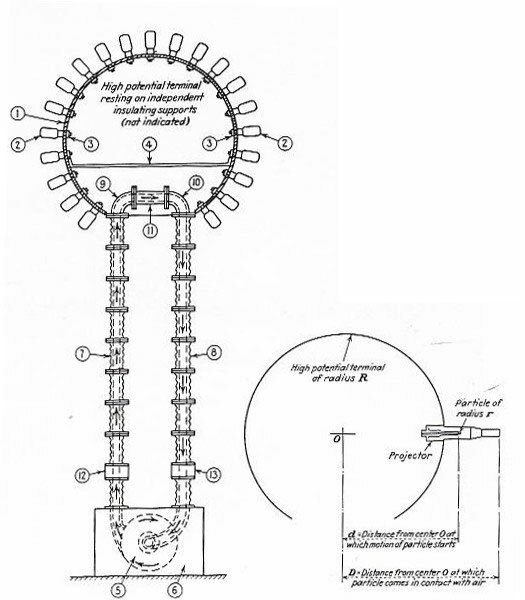 These devices and methods of operation will be explained by reference to the attached drawings in which Fig. 1 and Fig. 2 represent forms of the new open tube. In Fig. 1, the device consists of an inner cylindrical conduit 1, cemented to a metallic socket 3, and an outer conduit 2, which is tightly screwed to the socket by a nut 4, and has on the open side a taper with a cylindrical end 9, of the same inside diameter as conduit 1. The socket 3, is bored out to provide a large chamber around the inner conduit and carries a pipe 7, through which thoroughly desiccated air or other gas under suitable pressure is supplied. The open end of the inner and the tapering part of the outer conduit are ground to form an expanding nozzle 8, through which the air escapes into the atmosphere thereby creating a high vacuum in the inner conduit. The socket 3 has a small central hole and is provided with an inside extension 5, and a threaded outside projection 6, the latter serving for connection to a container supplying automatically suitable particles or material for same while the former fulfill the purpose of charging them as they emerge from the hole. The conduit 1 and 2, may be made of fused quartz, pyrex glass or other refractory material and it is obviously desirable that all the parts of the apparatus have small and nearly equal coefficients of thermal expansion especially when the working medium, which might also be superheated steam is at an elevated temperature. It will be observed that in this tube I do away with the solid wall or window indispensable in all types heretofore employed, producing the high vacuum required and preventing the inrush of the air by a gaseous jet of high velocity. Evidently, to secure this result, the dynamic pressure of the jet must be at least equal to the external static pressure. Some allowance should be made for the frictional loss in the nozzle and the outlet channel and also for the deflection of the jet. For most purposes, the velocity need not be much greater, but as the degree of rarefaction depends on the square of V, it is desirable to obtain as high a value as practicable. Usually, vacuums obtained by a mercury vapor pump are considered very high. In those, the velocity is only 280 meters per second but the vapor is 6.9 times heavier than air. Therefore to get the same vacuum in the air jet, its speed should be 280 x [6.9]1/2 = 735 meters. With a working medium at high temperature and pressure, both within practicable limits, this value can be attained and even exceeded. Thus, a gaseous jet of very high velocity affords a means for closing the end of the tube, more perfectly than any window that can be made while at the same time permitting and facilitating the exit of the particles. Referring to fig. 2., it shows schematically a modified form of my tube intended for various scientific and practical uses when it may be preferable or necessary not to discharge the jet through the open end. The construction of the device will be easily understood in view of the foregoing description like parts being similarly designated. A cylindrical conduit 1, is provided as in fig. 1, but the outer cone is replaced by a block 2, of lava or other insulating material shaped as indicated and firmly cemented to the conduit 1, which is hermetically joined by a nut 4, to a metallic plug 3, having a central hole, and extensions 3 and 6, serving the purpose stated above. 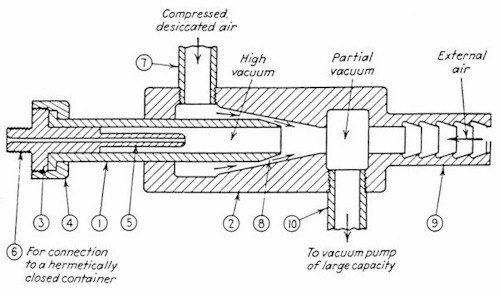 The working fluid, as compressed desiccated air, is supplied by means of a pipe 7, to a large annular space around conduit 1, and escapes through an expanding nozzle 8, formed by the tapering part of the block and the end of the conduit, into a chamber connected by a pipe 10, to a vacuum pump of large capacity - not shown on the drawing - for carrying off not only the air issuing from the nozzle but also that rushing in from the outside through the open end 9. In order to minimize the volume of the latter, I avail myself of an invention of mine known as the "valvular conduit" by providing the wall of the open end 9, with recesses as indicated giving rise to whirls and eddies which use up some of the energy of the stream and reduce its velocity. In this way, a pressure of about 100 millimeters of mercury can be readily maintained in the chamber increasing greatly the expansion ration of the air and its speed through the nozzle. It is hardly necessary to remark that my open vacuum tubes require mechanical power for operation which may range from 10 to 20 h.p., but this drawback is insignificant when considering the important advantages they offer and I anticipate that they will be extensively employed. It remains to be explained how such a tube is utilized for imparting to a particle to be projected a very great charge. Imagine that the small spherical body be placed in a nearly perfect vacuum and electrically connected to the large sphere forming the high potential terminal of the transmitter. By virtue of the connection, the small sphere will then be at the potential of the large one no matter what its distance from the same but the quantity of electricity stored on the small sphere will vary greatly with the distance and be proportionate to the difference of its potential and that of the adjacent medium. If the small sphere is very close to the large one, this difference will be insignificant and so to the charge; but if the small sphere is at a great distance from the large one where the potential imparted by the same to the medium approximates zero, the quantity of electricity stored on the small one will be relatively enormous and equal to Qr/R. To illustrate, if r = 1/100 e.s. and R = 1000 e.s. and Q = 108 e.s. units, as before assumed, then Q =1000 e.s. units which is a hundred thousand times more than previously obtainable. At a distance 2R from the center of the terminal, at which the difference between the potential of the small sphere and the adjacent medium will be half of the total, or 15,000,000 volts, Q will be 500 e.s. units and from theoretical considerations, it appears that the best results will be secured if the particle is charged in high vacuum at that distance. It can be accomplished all the more easily the smaller the radius of the terminal and this is one of the reasons why my improvement, illustrated in Fig. 3, is of great practical importance. As will appear from the inspection of the drawing, the spherical frame of the terminal is equipped with devices, one of which is shown in the enlarged view below and comprises a bulb 2, of glass or other insulating material and an electrode of thin sheet suitable rounded. The latter is joined by a supporting wire to a metallic socket adapted for fastening to the frame 1, by means of nut 3. The bulb is exhausted to the very highest vacuum obtainable and the electrode can be charged to an immense density. Thus, it is made possible to raise the potential of the terminal to any value desired, so to speak, without limit, and the usual losses are avoided. I am confident that as much as one hundred million volts will be reached with such a transmitter providing a tool on inestimable value for practical purposes as well as scientific research. Perhaps the most important of these inventions is the new high potential electro-static generator, schematically represented in Fig. 4, which is provided with my improved terminal consisting of a spherical metallic frame 1, with attachments 2, adapted to be fastened to the former by nuts 3, as above described. The terminal has a platform 4, in the interior of the frame intended for supporting machinery, instruments and observers, and is carried to a suitable elevation on insulating columns omitted from the drawing for the sake of simplicity. To energize the terminal, air under pressure is driven at high speed through a hermetically closed channel comprising a turbo compressor 5, with intake and outlet connections, conduits 7 and 8, special fittings 9 and 10,and a short pipe 11. The conduits 7 and 8, are preferably composed of pieces of glazed porcelain bolted tightly together, the joints being made airtight by suitable packing and are corrugated on the outside to minimize electrical leakage. The fittings 9 and 10 and pipe 11, may also be of the same kind of material. The air before entering and after leaving the compressor, as well as all apparatus within the airtight enclosure 6, is effectively cooled and maintained at a constant temperature by means as ordinarily employed which was not thought necessary to illustrate. The operation of the machine will be understood most readily by likening the moving column of air to a running belt. When the air, leaving the compressor, reaches the device 12, containing discharge points electrified by a direct current of high tension, it is ionized and the charge imparted to it is carried upward to the special fitting 9, where it is drawn off by sucking points and charges the terminal. On the return to the compressor the air passes through special fitting 10, where it receives electricity of the opposite sign conveying it to the device 13, and from there to the ground. These actions are repeated with great rapidity. The generator can be made self-exciting by suitable connections. For several reasons, I estimate that a machine as described will have an output of many times greater than a belt generator of the same size and, besides, it has several other important construction and operative advantages. V = √2 x 5 x 107 x 1000 x 1011 / 1000 x 7686 x 500 = 1,613,000 centimeters or 16,130 meters per second. as found above by my formula which is always applicable while the latter rule is not. Since a joule is equivalent to about 10,000 gram-centimeters, the kinetic energy is equal to 105 gram-centimeters or 1 kilogram-meter. In order to determine the probable trajectory the air resistance encountered by the particle has to be estimated from practical data and theoretical consideration. Very extensive ballistic tests by French experts have established conclusively that up to a velocity of 400 meters per second, the resistance increases as the square of the speed but from there on, to the highest velocities attained, the increase is directly proportional to the speed. On the other hand, it has been found in tests with rifles that an ordinary bullet, 8 millimeters in diameter and three times as long, fired at 400 meters per second, encounters a mean resistance of about 0.02 kilogram and from these facts, it can be inferred that the average resistance of the particle at the maximum speed V might be of the order of 1/64,000 of a kilogram and if so, the trajectory should be approximately 64,000 meters or 64 kilometers. Obviously, resistance data cannot be accurate, but as the mechanical effects can be increased many times, there should be no difficulty in securing the practically required range with a transmitter as described. In all probability, when the technique is perfected, results will be obtained which are thought impossible at present. Such a particle, notwithstanding its minute volume of 1/250,000 cubic centimeter, would be very destructive. It would pierce the usual protecting covering of aeroplanes, put machinery out of commission and ignite fuel and explosives. To combatants, it would be deadly at any distance well within its full range. Projected almost simultaneously in great numbers, the particles would produce intense heating effects. In action, against aeroplanes, the range would be very much greater on account of the smaller density of the air. Evidently, the smaller the particles, the greater will be their speed. For instance, if r = 1/10,000 centimeter, a velocity of 160,000 meters per second will be attained. An enormous increase in speed and range would be secured with particles of a diameter smaller than 800 times the molecular diameter. It is important to devise a thoroughly practical and simple means for supplying particles and I have invented two which seem to meet this requirement. One is to feed tungsten or other wire from a spool in a closed container joined hermetically to the projector, the rotation of the spool being under control of the operator. Using wire 2/100 centimeters in diameter, twenty cubic centimeters of the same would provide material for 5,000,000 particles. The other device consists of a closed container fixed to the projector and filled with mercury which can be expanded by external and controllable application of heat and forced, under great pressure, through a minute hole in the extreme end of the extension reaching to the distance d as before illustrated and explained. The droplet torn off and projected would have the hardness of steel owing to the great capillary pressure. If mercury can be used for the purpose, this means is ideally simple and cheap.